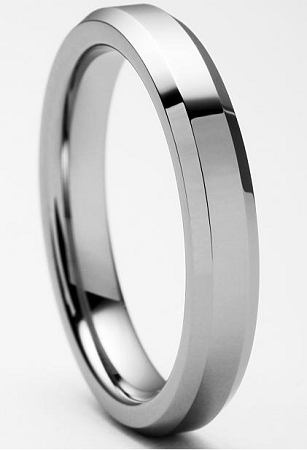 Fantastic simple 4mm highly polished beveled tungsten ring. This Nicollo 4mm beveled tungsten ring also comes in a 7mm, 8mm and 10mm. Q: I would like this ring in a 7mm but it doesnt show that option when u check out? My wife picked out this ring as her wedding band because she loved the engagement ring that I picked out from TF so much! They look fantastic together. I have to make note of the fact that the first ring they shipped out was too small, but the customer service was so great! They swapped out the ring, no problem at all, and made sure that we received the new one before our big day. We got matching rings and they look absolutely marvelous! Shiny and sturdy, they look as good as the first day we got them. The mass is nice and makes it durable but not overwhelming on your finger. So glad we chose these! The ring fit my girlfriend very well and it looks simple and classy will definitely order again from here! Beautiful, understated. Love this ring. Overall, this is a very nice ring. It really does look like the picture. I take my ring on and off at the end of each day and while doing yard work. However, this ring you can leave on even in dirt and grime. Seems rather indestructible. This ring is fabulous. Comfortable and durable. Very happy with the purchase and the service was fast! Absolutely gorgeous ring. The shine is brilliant. Very quick shipping. Wonderful Service. Thanks! I received my new ring last week , and could not be happier. My husband wears the men's version so I really like that they match . We have purchased before and will continue to purchase in the future. Thank you for you beautiful work. Wedding band is beautiful. So excited. Beautiful ring. My husband and I have matching Nicollo Tungsten Beveled Rings and we love them. We have received a lot of complimentary comments on our rings. Highly recomend. Great customer service. I purchased 13 Tungsten Rings. They are of very high quality and I am very happy with them. If you like simple yet elegant looking rings, these are for you. Absolutely love these rings... VERY well crafted. I'm highly impressed. They've endured the gym, tools, changing a tire on my truck, and still look brand new. I get compliments all the time on it, as does my fiance. The pictures really don't do it justice. And for the record...this company has been absolutely phenomenal to work with. I have been so impressed with everything they've done, going above and beyond in every dealing I've had. This ring was very good quality. It was a little big and I exchanged it for a smaller size. Absolutely great service and I would definitely order from here again. I love this ring. We used it for me wedding band as my permanent bands were not going to be ready in time. The ring is beautiful and perfect when I just want to wear a simple wedding band. Would definitely recommend. Got this for my wife and she loves it - very nice and not too heavy like some of the other bigger tungsten rings.